A 43-year-old secretary presented with swelling of her right face and nasal discharge two weeks after a dental extraction. She was referred to the otolaryngologist for a suspected maxillary sinus abscess. Examination revealed swelling of the face over the cheek with deviation of the left nostril. The left eye was proptosed with superior displacement of the globe. Her right vision was 6/9 and there was no afferent pupillary defect. An urgent scan showed a mass lesion arising from the maxillary sinus. The lesion eroded through the orbital floor and the medial wall into the palate, orbit and extended as far as the extradural space in the anterior cranial fossa. Biopsy showed squamous cell carcinoma. The patient was informed of the diagnosis and given the choice of radical surgery followed by radiotherapy or just radiotherapy. Radical surgery was decided upon. Before the surgery, the patient's vision was noted to have declined to 6/60 with an afferent pupillary defect. The patient underwent total right maxillectomy, right exenteration and exploration and excision of tumour from the anterior cranial fossa. Cervical lymph nodes were also biopsied for any presence of metastasis. A free flap from her thigh was taken by the plastic surgeon to cover the facial defect. The right upper palate was covered with a dental obturator. a. 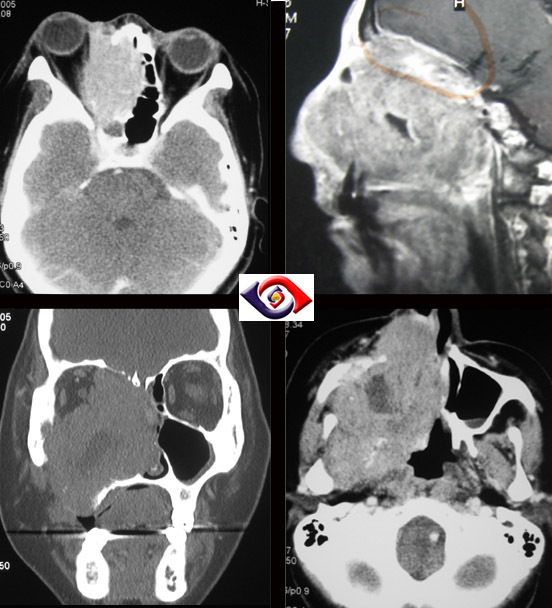 How common is maxillary sinus carcinoma? b.How does maxillary sinus spread to the anterior fossa? c. What is the ohngren's line? d. What is the main disadvantage of covering the cheek and exenterated orbit with a free flap?